This article explains how to user the R365 FTP Site to upload AP Invoice, AP Credit Memo and Documents to Process files. When you are ready to import files via FTP, open the FTP folder (or use your preferred FTP Client) and copy/paste or drag/drop the files in to the main folder. You do not need to copy the files in to a specific folder, as the FTP service will scan the file extension and direct the file to the correct import destination. Now when you have files to import, browse to the FTP folder just like any other folder you would browse to on your PC or Mac. For example, on a PC open Windows Explorer folder (as if you were going to My Documents) and you'll see the new folder you created named R365 FTP in the left hand navigation section. Be sure not to add/delete any folders as each one is required for the process. After a file is transferred to the FTP, it will automatically be routed to either the 'Processed' folder (meaning that it processed correctly into the system) or into the 'ErrorLog' folder. See below for additional information about the ErrorLog folder. When the files no longer appear in the main folder, they have been processed. 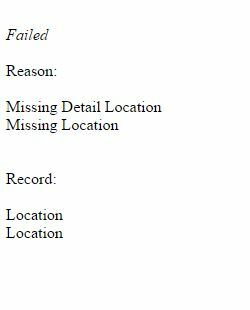 A typical error log would look like this. This error indicates that the Location Name or Number was missing or did not match the Location Name or Number in Restaurant365. Refer to the Troubleshooting Errors article for more information on specific errors. If the error is the result of bad data that has been provided by your Vendor, you will need to identify the error (Incorrect Location Number etc.) and work with your Vendor to update the value in the file. This will allow the file to be re-imported. This is a very manual process, so we recommend that you work with the vendor to correct the file errors for future error-free and seamless imports.